KENNEDY SPACE CENTER, FL – Following a two day orbital chase and ballet of carefully choreographed thruster firings, the SpaceX Dragon cargo capsule launched at lunchtime on Monday Aug. 14 with tons of science and supplies arrived in the vicinity of the International Space Station (ISS) this morning, Wednesday, Aug 16. While Dragon maneuvered in ever so slowly guided by lasers, NASA astronaut Jack Fischer and ESA (European Space Agency) astronaut Paolo Nespoli carefully extended the stations robotic arm to reach out and grapple the gumdrop shaped capsule. They deftly captured the Dragon CRS-12 resupply spacecraft slightly ahead of schedule at 6:52 a.m. EDT with the station’s 57.7-foot-long (17.6 meter-long) Canadian-built robotic arm while working at a robotics work station in the seven windowed domed Cupola module. The million pound orbiting outpost was traveling over the Pacific Ocean north of New Zealand at the time of capture. Liftoff of the SpaceX Falcon 9 took place precisely on time 2 days earlier with ignition of the 9 Merlin 1D first stage engines from seaside pad 39A at NASA’s Kennedy Space Center in Florida today (Aug. 14) at 12:31 p.m. EDT (1631 GMT). The two stage Falcon 9 stands 213-foot-tall (65-meter-tall). The combined output of the 9 Merlin 1D first stage engines generates 1.7 million pounds of liftoff thrust, fueled by liquid oxygen and RP-1 propellants. See an exciting gallery of launch imagery and videos including the thrilling ground landing of the 156 foot tall first stage booster back at Cape Canaveral at Landing Zone-1 – from this author and several space colleagues. Ground controllers then carried out the remainder of the work to berth the SpaceX Dragon cargo spacecraft at the Earth facing port on the Harmony module of the International Space Station at 9:07 a.m. EDT. The crew was perhaps especially eager for this Dragons arrival because tucked inside the more than 3 tons of cargo was a stash of delicious ice cream treats. 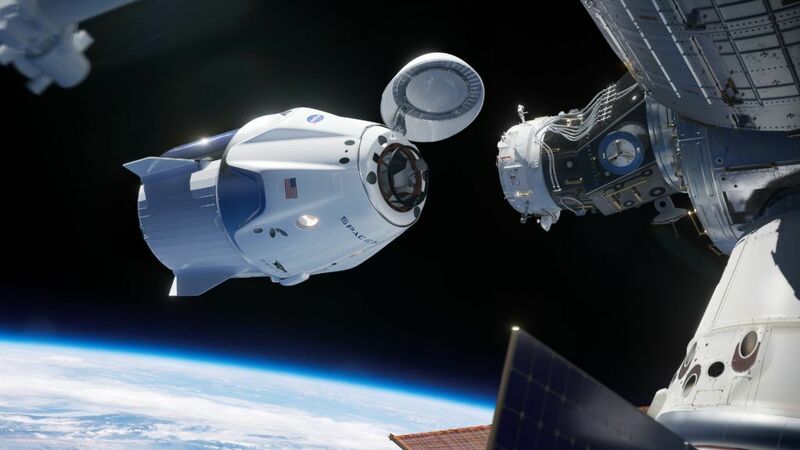 “The small cups of chocolate, vanilla and birthday cake-flavored ice cream are arriving in freezers that will be reloaded with research samples for return to Earth when the Dragon spacecraft departs the station mid-September,” said NASA. Indeed the crew did indeed open the hatches today, early than planned, a few hours after arrival and completion of the requisite safety and leak checks. The whole sequence was broadcast on NASA TV that began live arrival coverage at 5:30 a.m showing numerous stunning video sequences of the rendezvous and grappling often backdropped by our precious Home Planet. The current multinational Expedition 52 crew serving aboard the ISS comprises of Flight Engineers Paolo Nespoli from ESA, Jack Fischer, Peggy Whitson and Randy Bresnik of NASA and Sergey Ryazanskiy and Commander Fyodor Yurchikhin of Roscosmos. The SpaceX Falcon 9/Dragon CRS-12 launch was the first of a rapid fire sequence of a triad of launches along the Florida Space Coast over the next 11 days of manmade wonder – Plus a Total Solar ‘Eclipse Across America’ natural wonder sandwiched in between ! !